The operation then works as expected. Since foo does not exist in the dictionary, the get method returns 1, which is multiplied by 2 and stored in words with a key of foo. You can use this method for both creating and querying the dictionary, but it's not the only way. See class notes if you wish to do it another way, or need more reference for using get. In this lab you will investigate the performance of three different implementations searching for words in files and determining their frequency in a given data set. You will be reading data (on which to execute the queries) from a file and the following describes what is done with one data set. Before you read any of the data to query, a query list is generated for you. This is done by reading the entries in file query_file.txt which contains words, one per line. Each word appears in lower case. The words are read and stored in the list query_list. doc_list stores the words in the same order as they appear in the file. This part is done for you. doc_list_sorted should store the words in doc_list, only in sorted order (increasing). This part is done for you. doc_dict is a dictionary that uses the words from doc_list as the keys and the number of occurrences of each word as the value related to the key. Record the time it takes to create each structure (again, the first two are done for you). For that reason you are not creating the three structures simultaneously (which would be more efficient), but one after the other. This means opening and closing the document file three times. The time taken for creating each structure should be stored in the time_list, time_list_sorted, and time_dict lists. These lists are already created for you, so you just need to call the appropriate function to append the times to the lists. For doc_list, the count method is used. For doc_list_sorted, the provided sorted_count method is used. For doc_dict, the number of occurrences is already provided from when you generated the structure, so you just need to reference this data. Store the resulting time in the appropriate list (it will end in _query). Again, these lists are created for you. 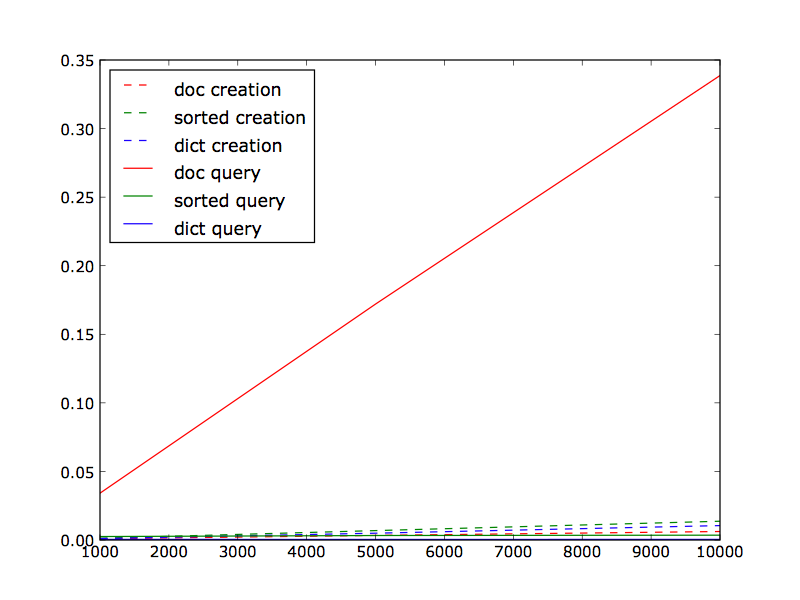 You should notice that the query time for an unsorted list by far dominates the time for every other recorded time. To get an idea of how the other times compared to each other, remove the query time for the unsorted list from the plot and generate a new plot or use the zoom tool to focus on the other lines. An example of the second graph is shown below.. You should submit both plots with your code. You should also write a comment in your code that explains why the graph is as you observe. That is, explain why some structure is faster than another structure for querying but slower for creation, etc. Provide data for testing: query file with 10 words, document file with 20 words. x in the sorted list. # to change them, since matplotlib will not draw a line with a single point. 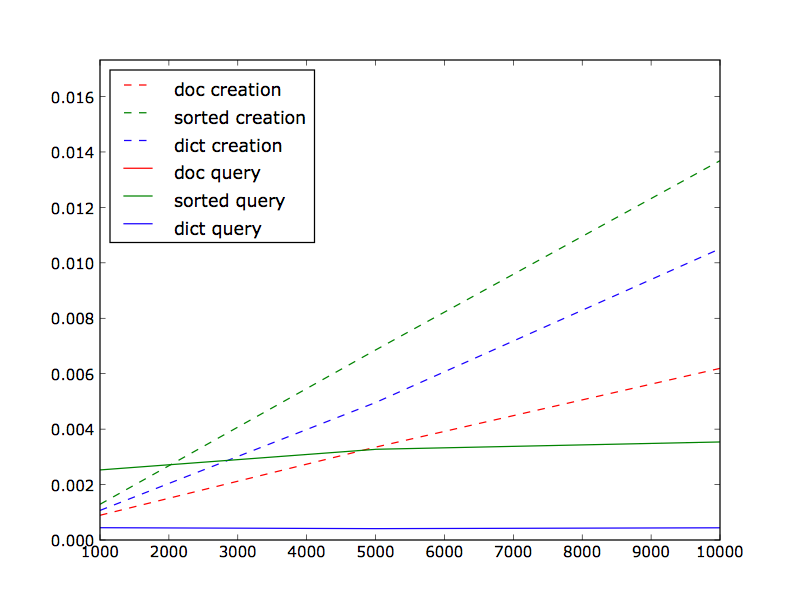 # list and sorted list and performs the query for both. # it in the x_axis list. # what lines are what timings.